Barron, Emma 2018. Popular High Culture in Italian Media, 1950–1970. p. 245. Schweikert, Uwe 2013. Verdi Handbuch. p. 557. Schweikert, Uwe 2001. Verdi Handbuch. p. 496. Zoppelli, Luca 2001. Verdi Handbuch. p. 234. 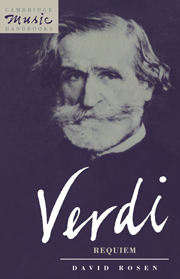 Verdi's Messa da Requiem is one of the most frequently performed works of the choral repertoire, and one of Verdi's most important non-operatic works. This new handbook offers an up-to-date account of the work's genesis, its performance history, and issues regarding performing practice. The central chapters provide a descriptive analysis of the work, while exploring some of the critical issues raised by individual sections, such as Verdi's interpretation of the text, his reactions to previous Requiems by Mozart and Berlioz, as well as the reception of his Requiem by critics. Subsequent chapters discuss some of the most important changes and revisions Verdi made in fashioning the Requiem. The author's final discussions investigate two critical issues: the work's unità musicale, and the central issue in its reception history, its generic status and the extent to which the Requiem is operatic.